Several months ago, I dyed some rice in rainbow colors using gel food coloring and vinegar. 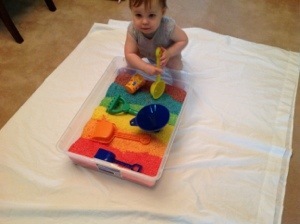 I intended it to be an indoor sand pit for those rainy/snowy days. Everyone made me nervous that Neko would make a disastrous mess in the house if she played with it…. So it took me a long time to be brave enough to try. Brave of you. Is that the vacuum cleaner in the background?